Putting the client first, we offer good, sound legal advice and representation in Grenada and throughout the Caribbean. Call us on 1 473 440 2500, or feel free to leave us a message below and we will get right back to you. Feel free to leave us a message and we will get right back to you. P.O.Box 386, 4 - 6 Lucas Street, St.George's, Grenada, West Indies. The founding partner, Mr. Ferdinand M. Henry, was called to the Bar in England just after World War 1 and the second partner, Sir Denis Henry Q.C. was called to the Bar in 1939. The firm of Henry, Henry & Bristol was formed in 1959 and the three partners were Mr. F. M. Henry, Sir Denis Henry Q.C. and Mr. Carol W. J. Bristol Q. C. The current principal is Mr. James A.L Bristol. Covers all travel & tourism related information about our unspoiled Caribbean island. Complete travel and vacation guide to Grenada, the Isle of Spice. The official web portal of the Grenada Government. The founding partner, Mr. Ferdinand M. Henry, was called to the Bar in England just after World War 1 and the second partner, Sir Denis Henry Q.C. was called to the Bar in 1939. The firm of Henry, Henry & Bristol was formed in 1959 and the three partners were Mr. F. M. Henry, Sir Denis Henry Q.C. and Mr. Carol W. J. Bristol Q. C.
The current principal is Mr. James A.L Bristol. 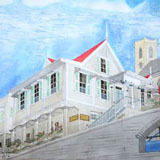 Address: P.O.Box 386, 4 - 6 Lucas Street, St.George's, Grenada, West Indies. © 2018 Henry, Henry & Bristol. All Rights Reserved.